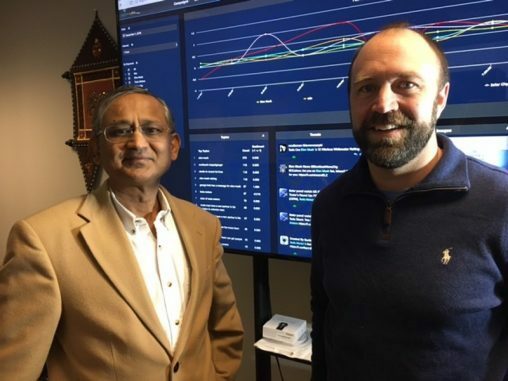 Amit Sheth, left, and James Mainord, co-founders of Cognovi Labs, which uses Twitris, software developed at Wright State that analyzes words, emotions and other factors in Tweets. A company that predicts the future through social media. A business that pulls information from noise. Science fiction? Nope. Reality. These are examples of ideas conceived at Wright State and successfully commercialized thanks in part to the university’s fast-growing tech-transfer program. In addition to helping launch several startup businesses, the Wright State Research Institute’s Commercialization unit and the university’s Technology Transfer Office are working on more than 25 active projects. There have been eight invention disclosures and 14 patent applications in the last year alone. The offices have also helped support entrepreneurs and startups through a multitude of programs, services and an online technology guide that includes a website and blog. A major success has been the Twitris technology developed under the leadership and guidance of Amit Sheth, LexisNexis Ohio Eminent Scholar and executive director of Wright State’s Ohio Center of Excellence in Knowledge-Enabled Computing. Twitris is computer software that employs a sophisticated algorithm that analyzes words, emotions and other factors in Tweets on a massive scale to provide unprecedented insights, suggestions, actions or predicted outcomes. For example, Sheth and his collaborators used Twitris to predict that Great Britain would vote to leave the European Union before voting was over and that Donald Trump would win the U.S. presidential election hours before polls closed. Twitris has applications in finance, branding, law enforcement, emergency management and other areas. Sheth disclosed his Twitris invention to the tech-transfer office in 2010 and partnered with the office to commercialize it. The office has since exclusively licensed Twitris to Cognovi Labs Inc. The university will participate in the company’s commercial success through fees, royalties and equity. Equally important is the regional economic growth produced by the commercialization. The Dayton company has raised about $900,000 and is employing Sheth’s former students and looking to recruit more from the university. Another new startup is the sNoise Research Laboratory (sNRL). Founded by Jeffrey Smigelski, sNRL is focused on the science of noise using patented fractional scaling digital signal processing. It can reveal invisible information in electrical or physical phenomenon that can lead to technological advancements and better products. Applications include sensors, audio enhancement, voice synthesis and recognition, music synthesis, medical devices, security tokens, data mining, malware signature profiling and others. sNoise and Cognovi have collectively raised more than $1 million in outside funding. Many of the commercialization initiatives were funded by a $7 million grant in 2015 from the Department of Defense Office of Economic Adjustment’s Defense Industry Adjustment Program. The grant, which helps state and local governments adjust and diversify their economies, was secured through a collaborative effort of 11 local entities comprised of governments, businesses and institutions of higher education, including Wright State. 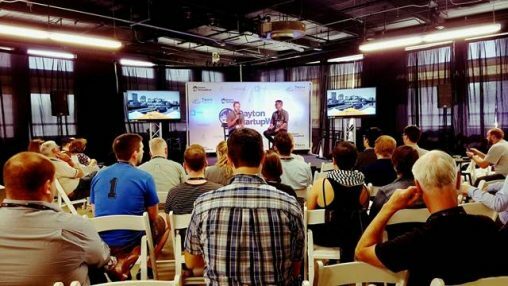 Dayton Startup Week helps entrepreneurs learn how to raise capital, do market research, create a social media strategy and make important startup moves. Early Risers. This monthly pitch event at The Entrepreneurs Center in Dayton brings together big companies and startups, giving executives the opportunity to find innovative solutions to their challenges and increasing the entrepreneurs’ odds of finding the resources they need to launch their businesses or take them to to the next level. “This has become one of the top commercialization activities in the region. Multiple Wright State faculty and students have pitched and furthered their efforts as a result,” said Bolton. Dayton Startup Week. Launched in partnership with TechStars worldwide entrepreneurial network. This five-day series of presentations helps entrepreneurs learn how to raise capital, do market research, create a social media strategy and make important startup moves. More than 400 people attended the event in September 2016 and more than 600 the following June. They included investors looking at regional technologies and commercialization infrastructure. The Dayton Tech Guide, which connects entrepreneurs and shares their startup knowledge. It includes a web page, blog and weekly “90-Second Guide to Dayton Tech and Startups.” It has nearly 1,000 web subscribers and 2,000 social media followers. Entrepreneurial Services Provider Program. Awarded by Ohio Third Frontier in March to The Dayton Entrepreneur Center, with Wright State as lead collaborator. The program offers services and assistance to technology-based entrepreneurs and small tech-based companies that have strong prospects to produce economic development. A program last December showcasing Wright State research and technologies as well as the Air Force Research Laboratory. Investors from across the nation, including Silicon Valley, attended. “Pints and Preneurs.” A happy hour series with Dayton’s tech and startup community typically held the second Tuesday of each month at local craft breweries. Attendance has been averaging more than 50 people and is growing steadily. Plans for a food tech event at Fairborn’s new restaurant incubator and an automotive tech event at the Sports Pavilion and Automotive Research Complex in Columbus. Plans for student- and faculty-focused events at the Vishal Soin Innovation Park across from Wright State. Wright State’s tech-transfer office is charged with identifying research that creates intellectual property, protecting that intellectual property and advising the faculty and staff on what their options are for using it in ways that benefit the university and society. “We have some tremendous research going on at the university that gets hidden in a lab. Short of pushing it out to market, no one knows about it,” Bolton said. 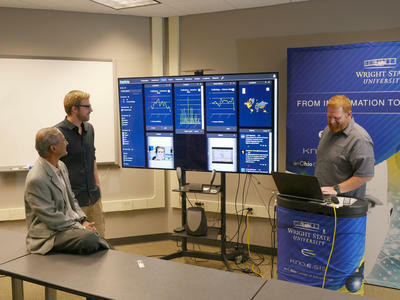 From left: Amit Sheth, executive director of the Kno.e.sis Center, and Alan Smith look on as Jeremy Brunn displays data gathered by Twitris. The tech-transfer office reaches out to Wright State researchers to learn about their work. If an invention is found, it first gets legally protected. Then commercial partners are sought to take it to market by creating non-confidential summaries of the invention and contacting parties that might be interested. The tech-transfer office covers patent law, copyright law, trademark law — legal matters that researchers are often not knowledgeable about. The office also serves as adviser to Wright State programs, student clubs and Air Force Research Laboratory programs. It has facilitated more than 25 outreach meetings and guest lectures in Wright State classes. Many of the inventions that have been presented to the tech-transfer office have come from the College of Engineering and Computer Science. One is a data-analysis invention and two others are scientific inventions that have the potential to impact human health as therapeutics. These inventions are in the process of being licensed to local startup companies. Sometimes inventions need further development before commercialization can begin. And the timeline from when the effort begins to commercialize an invention until it is actually commercialized varies, sometimes taking years. Before he came to Wright State, Sheth helped create two other startup companies from technologies he developed in his lab. The companies produced jobs and had a multimillion-dollar impact on the local economies. Sheth first received a series of research grants from the National Science Foundation (NSF) that funded graduate students who did their Ph.D. dissertations and master’s theses under his guidance and developed research prototypes. The students are named as co-inventors in the disclosure Sheth filed with the tech-transfer office. Sheth then won NSF’s I-Corps support, which enabled him to identify a commercial need, potential markets and a willingness by the private sector to pay for the technology. Subsequently, Sheth was awarded a NSF’s Partnership for Innovation grant to further scale up the Twitris technology and bring it closer to commercial grade. He and his team helped Cognovi Labs learn how to use the software and help stand the company up. Sheth said the steps to successful commercialization is to first get outside funding to develop and mature the technology and test the technology outside of the lab. Then get a thorough understanding of the market and its needs, get the technology as ready for commercialization as possible and finally be prepared to help the company implement and sell the technology. Wright State became an independent institution in 1967 and has grown into an innovative leader in the Dayton region and beyond, capturing the spirit of the university’s namesakes, Wilbur and Orville Wright, who invented the world’s first successful airplane from their Dayton bicycle shop. It celebrates its 50th anniversary as an independent public university in 2017.